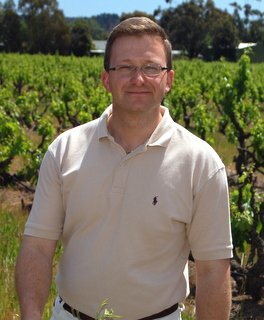 I visited McLaren Vale in October 2006, as International Judge at the McLaren Vale Wine Show, the annual examination of the region’s wines. A panel of expert judges from other Australian regions descends on McLaren Vale for two days of blind tastings to identify the wines worthy of bronze, silver and gold medals, and ultimately the trophy winners for the best wines it their class. Over the two days we tasted through 640 wines, a huge task made bearable by the unfailing good humour of the organisers and my fellow judges. After the tasting I spent the rest of the week getting to know the winemakers of McLaren Vale in a series of visits and tastings arranged for me. McLaren Vale is one of South Australia’s most beautiful wine regions, just 45 minutes drive from the city of Adelaide, on the Fleurieu Peninsula. 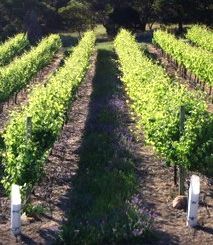 Vines cover the valley floor from the foot of the Adelaide Hills to the rugged cliffs and beaches. The region enjoys an almost Mediterranean climate, and though vines are now the major crop by far, olives and almonds grow wild throughout the region and fishermen land squid from nearby piers. McLaren Vale has become almost synonymous with Shiraz, most often expressed here in richly fruity wines with cherry, plum and spice aromas. But many other red wine grapes flourish, including Cabernet Sauvignon and Merlot, Grenache and Mourvèdre, and smaller amounts of many others, of which Tempranillo, Petit Verdot, and Sangiovese are probably most prevalent. For whites, Chardonnay is king, though Viognier, Chenin Blanc and Sauvignon Blanc are all quite widely planted, and experiments with everything from Italy’s Fiano to Spain’s Malvasia continue in an effort to find whites that really suit this climate and soil. Like almost every Australian region, water is a precious commodity, and the region was in drought conditions with water restrictions at the time of my visit. There are some dry-farmed plots of old trellised and bush vine Grenache and Syrah, but most plants need irrigation and that is a major headache. Systems of dams and water catchment schemes help, but recently a new pipeline has also been built that channels recycled ‘grey’ water back to the vineyards from the area’s water treatment plants. Historically, most farms in McLaren Vale grew grapes, but didn’t make wine. They sold their fruit to wineries locally, and across South Australia. Many of these farms have turned partially, or even entirely, to making ‘estate wine’ from their fruit. As yet there are relatively few wineries that are fully equipped to carry out every process from crushing to bottling, so a number of contract winemaking operations around the Fleurieu Peninsula provide service to smaller producers, and a couple of large bottling companies carry out the vast majority of bottlings. Chatting to an Australian winemaker can be something of a culture shock for those more used to visiting the estates of France. European winemakers (even the very biggest ones) like to stress the traditional, non-interventionist approach they have to making their wines. It’s not just that winemaking plays second fiddle to the ‘terroir’ of the vineyards; any hint that a wine has been manipulated in some way is an affront to French sensibilities. Aussie winemakers are a different breed: open about the technology they use, and pragmatic about the amount of intervention that kicks in once the grapes have been crushed. Across Australia, acidity is adjusted by the addition of the required amount of tartaric acid even before the grapes reach the fermenters, and almost all bigger brand wines have tannins supplemented too, with the addition of a powdered form. Other yeast cultures, enzymes and an array of treatments are employed to make sure wines are squeaky-clean and show exactly the aromatic, flavour and textural profile desired. But the latest technique that was on everyone’s lips on my visit to McLaren Vale was ‘sweet spotting’. The sunny and hot climatic conditions enjoyed by much of Australia means that sugar levels in grapes rise rapidly, and high levels of sugar (and thus potential alcohol once the juice is fermented) occur before full ‘phenolic ripeness’ of the grapes – the point where skins and pips are fully ripe and ready to pick and crush. To avoid phenolic under-ripeness, grapes must be given more ‘hang time’. But extra time hanging on the vines means sugar levels continue to rise, and alcohols of 15.5% or even higher result. Sweet spotting uses technology to lower the alcohol of a wine in small steps, so that, for example, samples can be prepared from a naturally 15.5% ABV wine in decrements of 0.1% – samples at 15.4%, 15.3%, 15.2% and so on, perhaps down to just 13.0% at the final stage. These samples are then tasted and assessed, to find the ‘sweet spot’ where the wine shows its optimum aroma and flavour, and is most balanced. The technology used to do this separates alcohol from the rest of the wine’s components by means of a membrane that only alcohol molecules can pass through. This alcohol ‘permeate’ can then be removed, and then gradually re-blended with the de-alcoholised wine to the desired level. There seems little doubt that this process must cause something to be lost from the wine (I’m sure artisan winemakers and their followers will be horrified at the very concept), yet the winemakers who use the technique swear that ‘sweet spotting’ is almost miraculous, insisting it is all about improving quality and flavour, and that the removal of a percent point or two of alcohol both brightens the quality of fruit and makes for more balanced, elegant wines. I certainly tasted the evidence in some beautiful wines that had been sweet-spotted, apparantly with no ill effects. Profiles of four of McLaren Vale’s most high profile estates follow. A future report will also look at some smaller wineries, and the ‘Wine Women of the Vale’, a collective of female winemakers who dragged me off for a day on a jaunt around the Vale. I met up with Andrew Locke, winemaker for Rosemount here in their large operation on the McLaren Flat. Though Rosemount’s roots are in the Hunter Valley, the company grew, became multi-regional, and eventually became part of Fosters, the world’s biggest wine group. This is now a seriously large facility, crushing 22,000 tonnes of grapes annually, which equates to around one fifth of the entire crush for McLaren Vale. 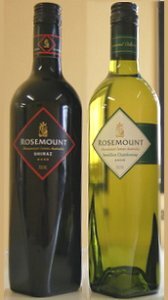 As well as producing such well-known McLaren Vale names as Rosemount Show Reserve Shiraz, GSM and their top Shiraz, The Balmoral, other wines made here will go into South Australian-labelled blends like Rosemount Diamond Label. But interestingly, fruit crushed and fermented here is also transported up to Penfolds’ main winery operation in Nurioopta, where it finds its way into St Henri Shiraz, Bin 707 and other premium Penfolds wines. Since the Foster’s takeover, it may also find its way into Wolf Blass’s Platinum label. The McLaren Vale operation is principally for red wines, though Andrew makes little bits of Chardonnay, Semillon and Sauvignon Blanc, grown close to the Adelaide Hills. The winery sprawls over a large area, having been extended several times over the years, and includes roto-fermenters for the most basic wines, stainless steel tanks, and 16 open-top cement tanks, lined with wax, which Andrew says are hugely labour intensive, but an essential part of the kit for the complex range of styles and price points he has to cover. We took a tour round some lovely old plots of ancient bush vine Grenache that has irrigation, but Andrew says he “just switched it off” a few years ago, and the Grenache (for GSM and other blends) is now dry-farmed. The Diamond label wines, in distinctive new packaging with funky diamond-shaped bottles, have recently been relaunched in the UK. The old Diamond Label brand had become very poor wines in my opinion. I found the new wines to be more moderately oaked, and less sweet than before, though still too sweet for my own palate. Whether Fosters can resist playing the BOGOF game again with this wine remains to be seen. Jock Bosworth and his partner Louise Helmsey-Smith entertained me for a full day at their beautiful old 1850’s farmstead home, surround by their extensive vineyards, part of which are farmed organically. They have also been reintroducing native vegetation in gullies and dried-up creeks around the farm, creating an idyllic little patch of McLaren Vale. Jock is a fairly serious grape grower and supplier to many wineries, but a percentage of his production goes into his own Battle of Bosworth label, that has been “Wine of the Week” on wine-pages recently. This is an intriguing range, including an Amarone-style wine called White Boar, made by cutting the cordons on Shiraz and Cabernet Sauvignon grapes, then leaving the bunches to dry on the vine in the heat and breeze of McLaren Vale, before fermenting into a 16% alcohol blockbuster. The quantity of ‘active ingredients’ in biodynamic sprays and treatments is indeed minute. Jock seems like a particularly pragmatic character: keen to do his bit for sustainability and the environment, but prepared to act only on evidence and his own acceptance of science, not the opinions of others. In many ways that sums up the Battle of Bosworth wines: solid, well-grounded and commercial, but also quirky, unusual and made with equal amounts of passion and care. 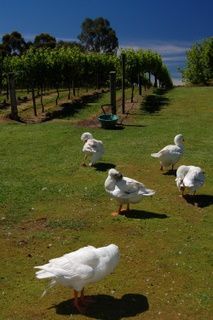 On of the great names of Australian winemaking, Geoff Merrill invited me to his picture postcard winery, where the rolling vines, rose garden and duck pond have been all but surrounded by city suburbs. Merrill produces five ranges of wine, starting with the Geoff Merrill brand that sells for around $15 AUS, and moving up through single varietals and reserve wines to the pinnacle of the portfolio, the superb Henley Shiraz, which is one of Australia’s most expensive wines at $150 per bottle. All red wines start off being treated equally: they are vinified and spend one year in American oak barrels. At this point, a barrel tasting determines which wines are good enough for the reserve ranges. These are filled into 2nd use French oak (previously used for Reserve Chardonnay) and just eight barrels selected for The Henley Shiraz. The Henley is a truly world class wine, that I served blind in a tasting seminar I presented to 60 winemakers as part of this trip. The Merrill logo represents a set of scales, which Geoff hopes sums up the Henley and indeed all of his wines: ‘Perfectly balanced’. Serafino is an impressive wine making facility, built as part of a complex of restaurant, conference facilities and more on Kangarilla Road called ‘McLarens on the Lake’. 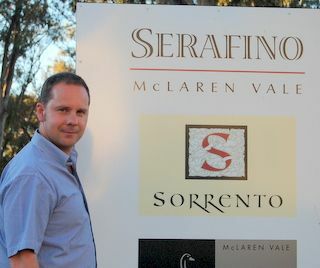 The ebullient Steve Maglieri owns Serafino, and winemaking is under the control of Chief Winemaker, Scott Rawlinson, pictured right. Fruit for Serafino’s own wines is sourced from the 300-acre family vineyard, comprising Shiraz, Cabernet Sauvignon, Tempranillo, Chardonnay and Sangiovese amongst others. 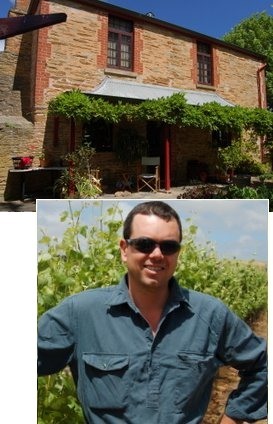 Scott has a large, very well equipped cellar at his disposal, and can dabble in small lots that he makes for clients, as well as very carefully made wines for Serafino. Also making thier wines in this facility is Shingleback, one of the hottest properties in South Australia. 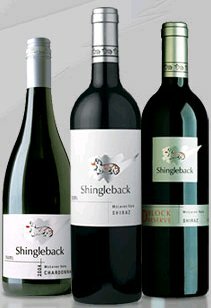 Shingleback won the Jimmy Watson Trophy in 2006 for their Shiraz, and their wines have picked up scores in the mid-90s from Robert Parker.Shingleback is owned by Winemaker/Viticulturist John Davey, whose 320-acre estate vineyard is on land purchased by the family in 1959. I met with Shingleback’s English-born Winemaker Dan Hills, a modest and endlessly patient character, with whom I shared a beer or two on my first night in the Vale, and who was also Chairman of the McLaren Vale Show.